Beacon Application Services Corporation is one of the most experienced providers of ERP expertise in the IT Services Industry. We have attained many levels of partnership with Oracle due to our long record of success over the years in the implementation of McCormack & Dodge, PeopleSoft and ERP Cloud applications. We are known for the strength, skill and experience of our staff. Beacon focuses exclusively on Oracle applications: HCM and ERP for both PeopleSoft and Oracle Cloud applications. Beacon has been an Oracle Platinum Partner since the program was established in 2009. We initially became an Oracle partner after the acquisition of PeopleSoft. Oracle has recently added cloud designations, while maintaining the overall Gold, Platinum, Diamond categories. Beacon has been an Oracle ERP Cloud customer and Cloud Partner since Release 10 in 2015. 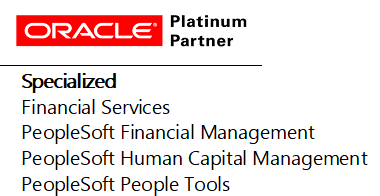 Beacon’s experience and successful track record has earned us Platinum Partner status in the Oracle Partner Network. Our customers can be confident that Beacon is well positioned to support their Oracle | PeopleSoft Enterprise projects. Beacon has also earned an Oracle Validated Integration through the Oracle Partner Network (OPN). This validation for ISVs gives our customers confidence that integration between Oracle PeopleSoft Enterprise Applications and Beacon’s software tool solutions have been validated and our products work together as designed. BEAM Change and BEAM Test are Validated with PeopleSoft 9.2. Beacon has been a customer of Oracle Public Cloud since 2016. BEAM Test for PeopleSoft application testing is available on the Oracle Cloud Marketplace, or can be run on-premises. A BEAM Test version for automated testing Oracle Cloud SaaS applications will be released in the 1st quarter of 2018.